Until 2004 the Cackling Goose was considered a small race of the Canada Goose. Based on differences in size, voice, habitat, timing of migration, and genetics, the American Ornithologist Union Committee on Classification and Nomenclature designated the Cackling Goose as a separate species. The breeding range is restricted to northwestern Alaska and northern Canada, and it typically migrates to California and the Midwest for the winter. There have been an increasing number of non-breeding season records for the Cackling Goose east of the Mississippi, including in Tennessee. Description: Cackling Geese look identical to Canada Geese except that they are smaller, nearly the size of a Mallard, and have a proportionately smaller bill. Both species have a black head and neck marked with a contrasting white "chinstrap." The back is brown, the chest and belly are pale, and the tail is black with a white rump band. Males and females are similar in size and appearance. The Canada Goose is identical in plumage, but is much larger with a proportionately longer bill. See link before for identification help for Cackling and Canada Goose. Habitat: Found near water, specifically wetlands, city ponds, lakes, and wet grassy or agricultural fields. 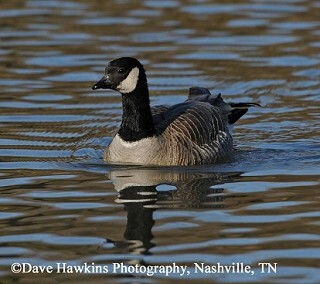 Nesting and reproduction: The Cackling Goose does not nest in Tennessee, however the similar Canada Goose is a fairly common nesting bird statewide. 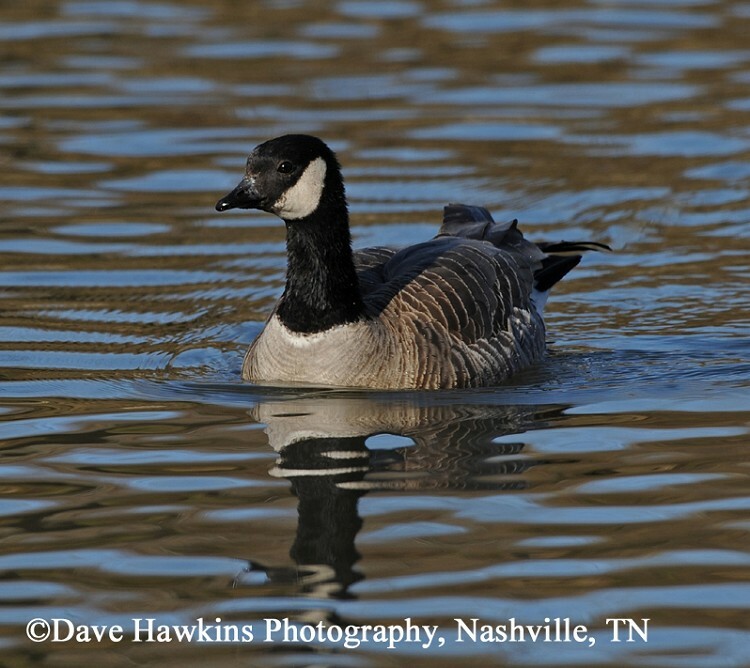 Status in Tennessee: A rare winter bird visitor across the state typically found in flocks of Canada Geese. The breeding range of the Canada Goose extends across all of northern North America, and populations differ in size. The Cackling Goose includes the smallest four of the previously recognized eleven subspecies. Best places to see in Tennessee: There are no regular places where Cackling Goose occurs in Tennessee. Robinson J. C. 1990. An Annotated Checklist of the Birds of Tennessee. Univ. of TN Press, Knoxville.